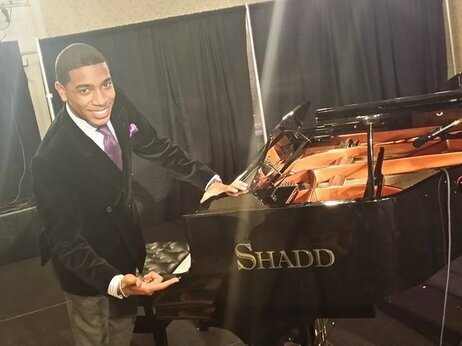 At the Mid-Atlantic Jazz Festival in February, one couldn’t help but notice the striking new grand piano on the main stage, emblazoned with the name SHADD. When the many accomplished pianists that wee­­kend sat down to strike those keys, it was equally easy to spot their delight in the instrument. 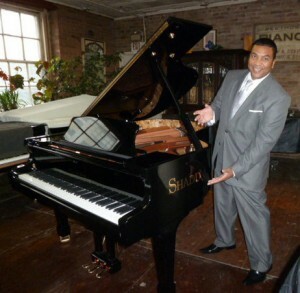 For Shadd, piano making is part of his birthright. His grandparents were musicians: His grandmother was a ragtime pianist in the South in the ’30s, and his grandfather invented (and performed on) a collapsible drum set. (He never patented it, a lesson his grandson learned.) 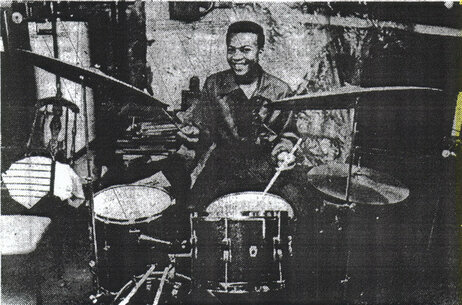 Shadd’s father was himself a piano technician, restorer, builder and performer — as well as a trombonist. And Shadd’s aunt was the NEA Jazz Master pianist and vocalist Shirley Horn. A child prodigy, young Warren made his own concert debut at age 4. Shadd Pianos are now in churches and concert venues across the U.S. — including the set of American Idol, where house keyboardist Wayne Linsey will play it on Wednesday night’s episode. On a recent visit to Warren Shadd’s home in a suburb of Washington, D.C. — a home that doubles as the Shadd Piano showroom — he spoke about his life and work. My father would have me do little repairs on the piano. When he went on these piano [repair] jobs, he would take me with him to see what the whole thing was about … and I would never want to go. I just wanted to stay home and play the drums; just wanted to be Warren Shadd the drummer. Except when he said he was going to the Howard Theatre — I was in the car before he got there! I wanted to see all these cats rehearse, see the show … I met Grady Tate when I was about 6 years old, playing with Jimmy Smith, then went full circle and played with Jimmy Smith myself. As I progressed and learned more about piano technology, I never aspired to; I just knew how to do it. I would say, ‘Piano is what I know, drums is who I am.’ As I went out there and toured with different acts, did a bunch of Broadway shows and got a little tired of the road, I learned how to tune, rebuild and restore pianos. I would take these pianos down to the nuts and bolts and build them back up just for fun, just for a hobby. I would take whole grand or upright pianos apart, build them back up with everything refinished — new strings, new soundboard, new keys, new ivories — for fun. And then my father would sell the piano. [Laughs.] I was about 12, 13 when I started doing this. The record player was always going, from Sonny Stitt’s Low Flame album, to Count Basie, to Buddy Rich, to Miles, to Wilson Pickett, Otis Redding, the James Gang, Iron Butterfly — I had a real potpourri and understanding of all genres of music. While I was doing this piano thing just for the heck of it, I was also performing with a bunch of folks. After I got through high school, I went to Howard University and was in the big band with Wallace Roney, Geri Allen, Gary Thomas, Noble Jolley Sr., Carroll Dashiell and Paul Carr. When my father passed in 1993, I took over the piano business full tilt, because he had all of these clients for tuning, rebuilding and restoring. He pretty much had Washington, D.C., totally sewn up with all the church pianos. So when I took it over, I already had a client base — it wasn’t like I had to start over fresh. We had all these contracts with churches. Coming in as the second generation of this business was phenomenal for me. Secure from being a musician on tour, it was a built-in job. As the industry changed a bit, I found that rebuilding pianos was not so much what I really wanted to do financially. I would take these pianos and beautifully restore them … and somebody would say ‘OK, I’ll give you $600 for it…’ [Laughs.] I’m like, ‘Dude, even the new strings I put on this cost four times that much!’ So I kind of migrated out of that restoration business into doing tunings and repair work. I would also exchange parts. I’d take a soundboard out of a Steinway and put it in a Baldwin to see what kind of reaction it would give, understanding the engineering, understanding which side vibrates the most. I’d exchange strings, put on heavier strings, lighter strings, to achieve a certain type of sound. Being a musician, I have an advantage of understanding what musicians want and what they want to hear. If I can compare here — Mr. Steinway doesn’t play piano, Yamaha no, Kawai no, Bosendorfer no, Fazioli a little bit … They are engineers and businessmen; I’m a musician and an engineer and businessman. I have somewhat of a musical advantage. What I’m crafting is a musical instrument and all those different components that go into that, especially the musical parts. From churches and especially symphonic tunings, you understood that the piano had a disadvantage in terms of the pianists especially being able to hear themselves play, because in church you’re in total competition with the Hammond B-3 organ or the pipe organ, the drums, the bass, the percussion, the choir and the congregation. They would put microphones in the piano, but they weren’t placed right to give you the most opulent sound of the piano. You would have to totally jack up that sound for the pianist to feel really comfortable. In the symphony, there’d be a floor monitor, but you’re totally surrounded by all these string instruments and you’re still at a disadvantage … and you just play the part. My first notion was enhancing the volume of the acoustic piano by itself, without any kind of electronics. Even if you add electronics, you’ll have more sound, because the origin of the piano will have more sound, more volume to it without distorting it — which is important, too. There’s a piano on the market that is somewhat loud, but as you play it louder, it has distortion. The soundboard is not made so well that it can take that kind of pounding. My pianos: You can stand on them and you will not get any kind of distortion. I studied and researched in the library and wrote a dissertation. I went back to some of those old pianos I restored, and I would experiment with the soundboard. I wrote this stuff on sheets of notebook paper and just put it away, didn’t really think that much about it. One day, I was tuning a piano at this old man Mr. Tucker’s house. As I’m tuning his old upright piano, he started whimpering. I said ‘Mr. Tucker, what’s going on?’ He said, ‘It’s all right, Shadd, it’s all right.’ So I go on tuning the piano, then he really starts crying a lot. ‘What’s wrong, Mr. Tucker?’ He said, ‘Shadd, see that piano? See that name on the front of it? That should say Shadd, because you’re the only one!’ I said, ‘OK, Mr. Tucker, I’ve got these ideas, I’m gonna go back and study.’ He pretty much planted the seed. I went back and blew the dust off of these old ideas that had been sitting in a cabinet, and I started trying to engage some of these parts and put some of these old ideas I had together. And then I said, ‘Why not try to do some of this stuff electronically?’ So I built this prototype piano. It took me two summers and there it is [pointing to a high-tech grand piano in the adjoining room]. I put an audio system in the piano where speakers are right in front of the piano, so the sound would come right to the pianist and the pianist can hear themselves play. And I put speakers under the piano and a subwoofer so you can get the full gamut of the piano and control the volume and graphic equalize each section of the piano — bass, alto, tenor and treble — so you could go to each section of the piano and customize it just like that. I went another step and made it MIDI, so you could play all of your electronic synthesizer sounds on the piano. For educational purposes, I made this piano interactive. I put a computer under the piano and I built this 24″ touchscreen on the front and a 13″ screen on the left and encompassed video cams throughout the piano. So on the other side, interactively, your piano teacher can see you, you can see your piano teacher, they can see our face, torso, left hand, right hand, pedal movement, and teach intelligently anywhere in the world … distance learning right there at the piano. From that point, you can also have your band on the other screen, so you can even cut tracks with your band live and in real time. You can teach and you can score on your touchscreen as you’re watching that, so it’s like a total workshop right in front of the piano. Now you can compete in a church environment, in a symphonic environment, because now you have the volume right in your face. But even taking it to another level … I have a [piano] bench that has surround sound; it has a subwoofer in it. So now, you don’t only just hear the music; you feel the music, so that every little nuance that you play on the piano down to the triple pianissimo … you feel everything that you’re playing. From there, I said, ‘Let me go back to the acoustic piano and see how I can apply some of that stuff to these new pianos.’ So I incorporated a lot of the soundboard technology that I invented — and I have patents on all of this technology, unlike my grandfather with the collapsible drum set. I assembled an A team of piano manufacturers around the world and sort of cherry-picked the best of the best. I said I want you to make this … in accordance to my patents and designs. My first piano, I sold to the Setai Hotel in New York, now called the Langham Place Hotel, and they play jazz there on this piano — seven days a week. I was trying to get a particular piano company to build my pianos. When I called, they said, ‘We’ll build your pianos if you bring us 1,000 signatures of people who would buy your pianos.’ A friend of mine suggested going to the Gospel Workshop of America, the big convention of all the ministers of music and trustees. It happens annually, and I’m thinking at that time all I had was paperwork: I had a provisional patent, but no prototype piano. I’ve got a lot of family in Detroit, so I got a couple cousins with clipboards to stand outside of my booth to get these signatures — the name of their church, their minister of music’s name, what kind of piano they had in their church, how many pianos would they replace if they were able, and how many would they replace with the Shadd Piano based on the technology you see [in his booth presentation]? I ended up with 864 signatures in four days. I got the rest of them from DC Public Schools. What’s been the reaction of the players to your piano? One player at a time. I call folks, they come over, they play the piano, and they’re wowed. Barry Harris was here three weeks ago and he’s brought some attention to some other folks about this piano. Church musicians are in here all the time now. I do know there’s a responsibility with this, to make the best piano — not one of the best — the best piano, period, in the world, and that’s what I believe I’ve done. As a people, we can’t be parallel; we’ve got to be three times as good. I’m a perfectionist, so every nuance that goes into this piano has to be the very best.